Business intelligence (BI) can be described as a set of techniques and tools for the acquisition and transformation of raw data into meaningful and useful information for business analysis purposes. The term "data surfacing" is also more often associated with BI functionality. BI technologies are capable of handling large amounts of structured and sometimes unstructured data to help identify, develop and otherwise create new strategic business opportunities. The goal of BI is to allow easy interpretation of these large volumes of data. Identifying new opportunities and implementing an effective strategy based on insights can provide businesses with a competitive market advantage and long-term stability. In order to give the users of this report an inclusive view on the business intelligence market we have included a detailed competitive scenario and product portfolio of major vendors. To understand the competitive landscape in the market, an analysis of Porter’s Five Forces model for the business intelligence market has also been included. The study encloses a market attractiveness study, wherein product segments are benchmarked based on their market size, development rate, and general attractiveness. 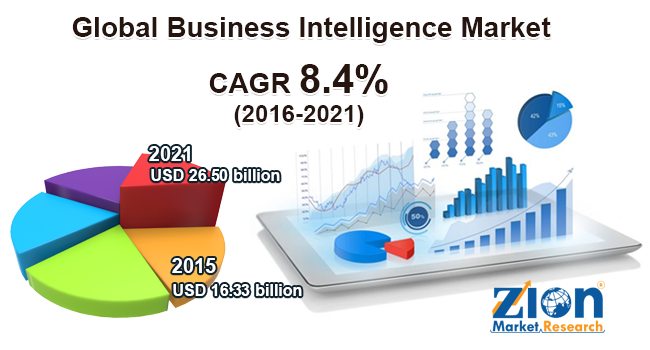 The study provides a decisive view on the business intelligence market by segmenting the market based on deployments and technology. All the deployment and technology segments have been analyzed based on present and future trends and the market is estimated from 2015 to 2021. Major deployment segments covered under this study include cloud, On-Premises BI and others. The regional segmentation includes the current and estimated demand for North America, Europe, Asia Pacific, Latin America, Middle East and Africa with its further bifurcation into major countries including U.S. Germany, France, UK, Japan, China, India and Brazil. This segmentation includes demand for Business intelligence based on individual deployments in all the regions and countries. The report covers detailed competitive outlook including the market share and company profiles of the prominent participants operating in the global market. Major companies profiles in this report include Microsoft, IBM, Oracle, Microstrategy, GoodData, Targit, SAS, and Tableau Software.